“Established in 1961, Aygaz is an only fully integrated LPG company in Turkey operating in all LPG processes, including procurement, storage and filling, as well as production and the sale of LPG-operated devices. Aygaz is also the first and only public LPG company in Turkey and currently provides its services in 81 cities with almost 4,000 cylinder gas dealers and auto gas stations. As the most preferred LPG brand in Turkey, Aygaz products enter more than 60 thousand homes every day, and approximately one million vehicles run on Aygaz Auto gas+. In addition to its 5 sea terminals, 6 filling facilities and 9 distribution centers, Aygaz has one cylinder manufacturing facility and one cylinder refurbishing facility, all of which meet international standards and operate using the latest technology. Aygaz has the largest LPG storage capacity in Turkey with 178,400 cubic meters. Aygaz has conducted marine transport operations using its own ships since 1967 and has three LPG ships that are specially equipped and fully pressurized. As you can see that many complex and detailed processes are being performed by Aygaz starting from sourcing, production, sales including dealers. In order to cover daily business transactions, Aygaz is mainly using SAP ERP, BW, MII, PO and HR for more than 10 years. Be Fast : Speed does matter, Aygaz definitely knows that being fast and fastest in the market is extremely important. If you have a fast system, your transactions are being performed fast, this means, each and every single transaction is done faster and that saves you the most valuable resource: time. If you have more time, you can do more: more innovation, more customer care and more profit ! Be Simple: Complexity kills creativity, so Aygaz decided to be more plain, to the point and customer oriented. If you are simple, you can adopt faster and easily. Be Real Time: Latency in ERP is like driving car by looking at the rearview mirror, if you have a real time operational system, then you can act fast by using technology, otherwise you need to predict near future by historic data, in other words, even with latest technology if you are not running a real time ERP, you will try to predict tomorrow by yesterday’s data, however you are loosing today. Now they are in the second phase, all processes are being analyzed and targeted result is having simple processes. This step will be done by not a selected team, this will be done by whole organization! 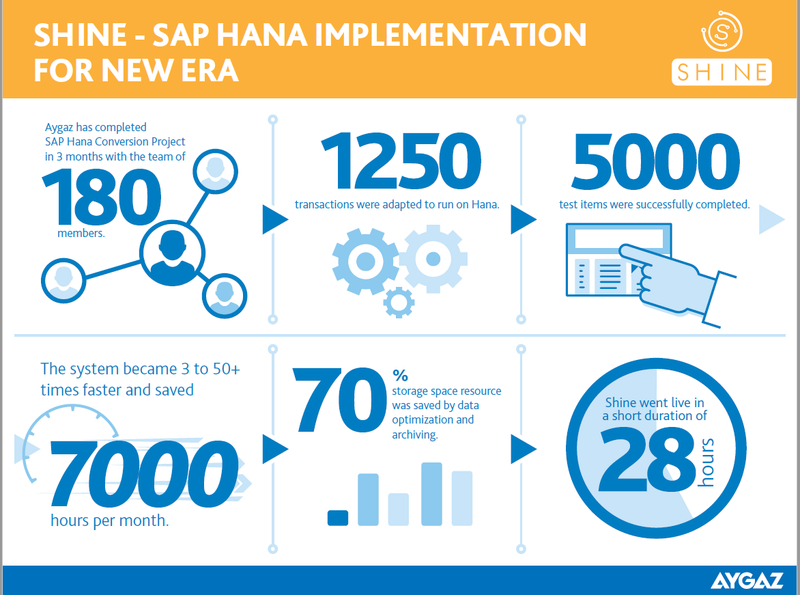 Last item will be completed by implementing S/4HANA Intelligent Enterprise, target is having the new system up and running end of 2020. I wanted to share Aygaz’s journey for others who want to start their journey, Special thanks to Aygaz SHINE team: Oguz Sezgin, Aslı Erdoğan, Emre Karakurum, Emre Tamer, Halit Aygenli, Hülya Çekim, Korhan Özduygu.